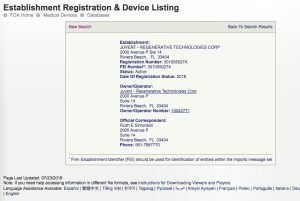 Is Juvent registered with the FDA? Yes. Below is a copy of our current Establishment and Device registration. Most of our competitors are not registered with the FDA. How do you use the Juvent Health Micro-Impact Platform? Simply plug it in, turn it on, and stand on the platform for 10 to 20 minutes. That’s all it takes to gain the benefits of Juvent’s passive micro-impact exercise. Feel free to read a book, watch television, use your tablet, or even eat or drink while using the Juvent Health Platform. What does the Juvent Platform feel like? You’ll feel gentle, soothing waves of micro-impact pulses traveling up from your feet into your legs and throughout your entire body. The sensation is pleasant and exhilarating, not intense or distracting. The Juvent Platform works by sending low magnitude, high-frequency energy waves through your body, and thus produces a quiet hum. Stand in the center of the platform and evenly distribute your weight to ensure a pleasant experience. Is the Juvent Platform safe? Yes. Juvent’s Micro-Impact Platform has been used in both children and senior published clinical studies. It is registered as a Class I medical device, the Juvent Platform is safe for young adults and seniors for up to several hours of use a day, per ISO standards (we only recommend the study doses of 10-20 minutes, 3 times per week). Many tell us they use their Juvent 10 minutes in the morning and 10 minutes before bed. It operates in a range of frequencies that experts have deemed safe. It then calibrates itself to your unique body composition, you can be confident in your health and safety. Be sure to read our Owner’s Manual for specific risk factors and contraindications. You will also want to consult with your physician before undertaking any new exercise program. We are continually shocked and dismayed by whole-body vibration vendors who have little or no published research making claims based on Juvent studies. They say they are safe, yet operate at energy levels of 10-50 times higher than Juvent’s micro-impact! They also operate at variable frequency ranges from 5Hz to 200Hz or higher without explaining the danger of organ resonance. Juvent operates at very safe 0.3 g’s of energy between 32Hz-37Hz, a range known to be very safe. Juvent’s micro-impact is possible because of our patented platform mechanism. It moves your body only 0.05mm in vertical distance. Contrast this to 2mm-10mm in most WBV platforms. 2mm is 40 times more displacement than Juvent! Imagine their claims of safety. No data, no studies just internet testimonials from nameless users. 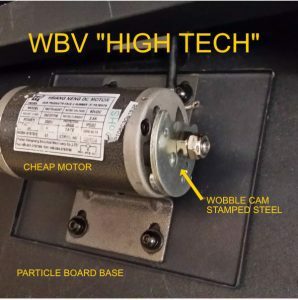 Most of these WBV vendors will not show you their mechanisms because they are usually just cheap motors with an out of round steel weight spinning around. How much does that cost to make? $50-$75? WBV vendors claim to support thousands of pounds in weight. Well, so do large industrial rock shakers or large paint shakers. If anything this should be a reason to not use these devices. The human body is a fragile system and very small amounts of energy and substances can have dramatic effects. Get a speck of sand in your eye and see how your body responds. Juvent’s platform is the result of over $40MM in research and development. There was a reason. Vibrating a human body is tricky business. Most vibration is NOT good for the body. Juvent’s patented micro-impact is. Our long-term, prospective, randomized trials prove it. Don’t be an unpaid, unsupervised research subject for a WBV company that just decided to start building a shaking platform because it was profitable. Your life and well being are worth far more than that. As with any medical device, you should consult with your physician before using it. You should not use the Juvent platform if you’re pregnant, history of deep vein thrombosis, or pre-existing retinal detachment problems. We have not had these complications but our Medical Advisory Board suggested that these could put one at risk. When the body doesn’t receive enough impact on a regular basis, bones and muscles can atrophy and suffer. The Juvent Health Platform is a safe, proven, medically sound method to get the essential impact that your musculoskeletal system needs. Can multiple people use the same Juvent Platform? Yes. Only the Juvent Platform contains our patented, proprietary technology that calibrates the micro-impact frequency to your particular body composition. Each time someone stands on it, within 12 seconds our computer adjusts to ideally fit his or her body, so multiple users of any shape and size can safely benefit from the Juvent platform. Juvent provides a dedicated support center at our Corporate Headquarters and Factory in Riviera Beach, Florida; Call 1-877-758-8368 with any questions, comments, or concerns. You’ll speak directly with a Juvent employee or receive an email response from one within 24 hours. Additionally, the Juvent Platform comes with a six-week risk-free trial and five-year limited warranty. Juvent does not make the decision on whether or not you qualify, nor the monthly amount. We also do not receive any of your credit information. All of your information is safe with PayPal. Why is the Juvent so expensive? Can’t I just use an inexpensive Whole Body Vibration Platform? Juvent’s Micro-Impact Platform is the U.S. manufactured, Registered Class I Medical Device. We use precision machined aircraft aluminum parts, aerospace actuators, gold layered motherboards (corrosion resistance and durability) all tested and calibrated to within 10,000th of an inch! We service and provide replacements parts to anywhere in the world. We continually strive to provide the best value, but will not compromise quality for a lower price. We have a test unit running in our facility for a simulated 150 years of continuous use! This is why we can offer a 5-year limited warranty on our platform. Juvent is designed to last for your lifetime. 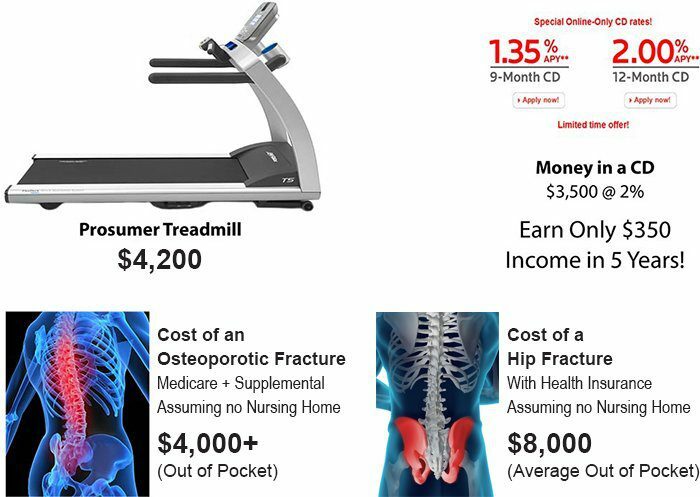 If you compare Juvent to a prosumer or commercial grade treadmill or recumbent bike we are very competitively priced. Most retail store consumer grade exercise equipment is designed to last only 3 to 5 years. That is why you see so many on the street for trash pick-up. We offer to finance through PayPal Credit*. If you were to put a down payment of $995, then the monthly payments would be less than $90 for 4 years*. That averages out to less than a $1 per day over 10 years. If you are 60 years old today the government actuarial tables say you should live to 90 years of age, that’s 30 years of use! Juvent is a great investment in your health. Your Juvent platform can also be shared by anyone in your household which makes it an even better investment. Most Whole Body Vibration(WBV) Platforms are inexpensive for a reason. Cheap motors, switches, metal and parts manufactured overseas with cheap shaker motors or cams; built out of pot metal (some metals from China have been shown to contain toxic metal waste), have little or no manufacturer backing and are designed to last just a few years. They are NOT registered with the FDA which means they are not required to track their adverse events. Most WBV Platforms are sold by small U.S. based distributors who buy a container of platforms in bulk from Asia for less than a hundred dollars each and BOOM their experts on a website. They then sell them for thousands of dollars and disappear. Repairs can be difficult or impossible. You may ask, “Well can’t I just turn down the cheap platform to 32Hz and 0.3g’s and have a Juvent?” Sounds good. Why not just go over to China and buy a load of cheap platforms? Right? Well, it’s not that easy. Our team has over 50+ years in the highly technical spinal and neurological medical device field and we understand the importance of Juvent’s technology. It is unique. If you turn a normal platform’s setting to a Juvent’s you will NOT get a physiologically effective dose of micro-impact. Why? Juvent is safe for long-term exposure. This is NOT true of WBV. It is a fact that, that like Juvent, WBV platforms can deliver health benefits. But at what risk? There are numerous examples in medicine where what seems right isn’t, take aspirin. You can thin your blood with 5 adult aspirin very quickly, but then bleed to death in a simple surgery or you can take a safer, longer-term approach using baby aspirin and survive. Both yield a positive cardiac effect. One way is good the other is not. If we could make a safe AND effective platform for less we would. The other challenge is that it can take years for the damage of chronic exposures to manifest themselves. Ask any professional football player or boxer. Their high impact exposure is now proving very costly and destroying lives. This is why the NFL Alumni uses and endorses ONLY Juvent to their players over any other platform. They have done the homework and understand all too well the consequences of WBV. Don’t gamble with your health and that of your loved ones. We care and that’s why we continue to build Juvent’s the way we do. We test every unit on a dual channel oscilloscope for proper signal and safety and then run it another 3 cycles to make sure it’s just right. When you amortize the cost of a Juvent over just its 5-year warranty, it is less than $2 per day. Over its operating life of 20+ years its only pennies per day. Juvent is a great value and investment. Go ahead and get started today to better health. *Subject to PayPal terms and conditions and qualifications. Why is Juvent a good investment? 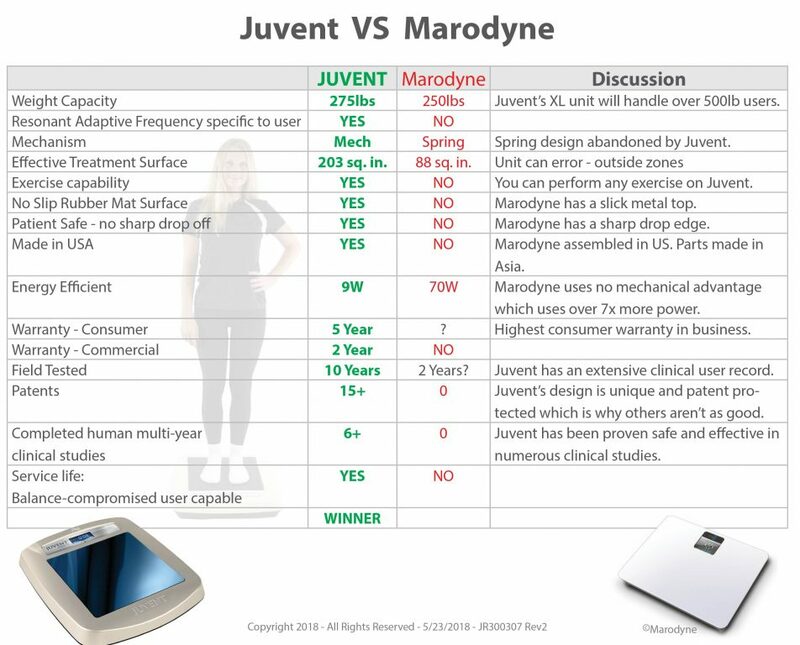 JUVENT vs. MARODYNE: Is the Juvent 1000N the same or similar to Marodyne’s LivMD? The short answer is no. Not close. While the old Juvent and Marodyne share a common founder, Clinton Rubin, Ph.D., and Drs. Rubin and McLeod did much of the early work in LMMS which led to the formation of Juvent, Dr. Rubin is not a listed inventor on Juvent’s current platform patents. This revolutionary design was invented and patented by Titi Trandifir and Donald Krompasick, two very talented engineers. Dr. Trandifir continues to consult with Juvent and has overseen our current design and production. See the comparison of the designs below. Notice that Marodyne’s LivMD is very similar to Juvent’s abandoned early design. Note the springs all around the edges on both the early Juvent design and Marodyne’s. Notice the center actuator on both. These were key faults of the early Juvent design that was abandoned for the current design (middle). LivMD’s is based on the earliest Juvent design which is difficult to use. Its center actuator design forces a user to stand balanced in the center of the platform to assure they receive signal. Additionally and equally as important, the LivMD design does not find the user’s resonant frequency. This is a central tenant in the effectiveness of LMMS/Micro-Impact. Without finding a users resonant frequency the small amount of energy (0.3-0.4g) is not sufficient to generate the clinical results seen in all of Juvent’s studies. 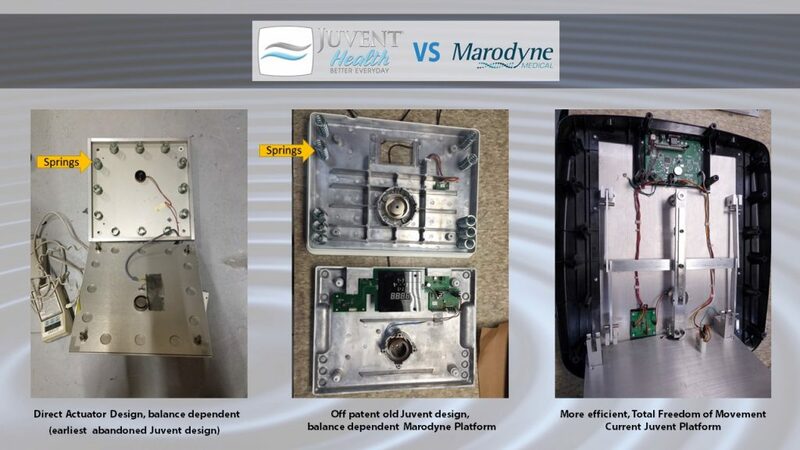 Below is a summary of the distinct advantages that Juvent has over Marodyne’s. From time to time we see internet posts from people and yes even some clinicians who do not understand the important differences in these two technologies. They say they are the same or that the LivMD is a “newer” design when in fact it is the older, abandoned design, chosen because it did not violate Juvent’s very broad patents. If you hear of someone making these claims they are either ignorant or dishonest which I would think you would want to avoid doing business with them. There are those wrongly claiming that Juvent is not continuing research or hasn’t improved its product. This is also untrue. Juvent has made many key improvements to the earlier design and continues to improve our product daily. We use gold in our motherboards, for instance, to dramatically increase the life of our units. But one thing that has stayed the same; we have not changed the trademark signal and process that has brought so many users success in the battle over poor bone health and joint pain. We are committed to this. There are also those who say that Juvent is charging too much for its product. Well, the early Juvent went out of business because they charged too little for their units. We have chosen to keep our manufacturing and assembly here in the U.S. to not only provide jobs to Americans but to also maintain the quality and signal that is so important to giving you the results you expect. This is not true of our competitors who build with the cheapest suppliers and parts. The old adages are true. A Juvent platform is an investment in you and your family’s health. The difference in price of $1,000 or $2,000 will soon fade, but the savings of buying a cheap WBV unit or a LivMD device will not fade as you realize that it is not a Juvent and that it does not deliver Juvent’s patented signal. You become a research subject. In summary. Juvent has very strong patents and its device AND software are unique in the industry. The fact that so many are trying copy it proves its value and uniqueness. We frequently test and follow-up on claims made by competitors or reps selling cheap knock-offs. They are not the same, not even close. It is sad that so many are being misled because their health is at stake. Stay with a proven product and brand. We are committed to providing you an amazing product and technology that has taken many years to perfect.